Testimonials and reviews help build trust with potential clients, resulting in them being more likely to schedule a massage appointment with you. Research from Nielson reports that 88% of people will trust online reviews. In fact, many prospective clients will automatically search for reviews and testimonials about your services. 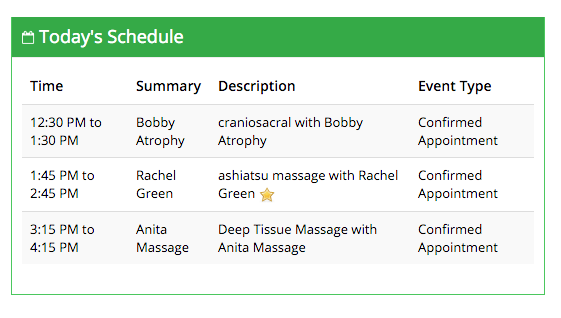 Make it easy for them by displaying raving reviews right on your massage website and online scheduler! Bodywork Buddy makes it painless to collect reviews. 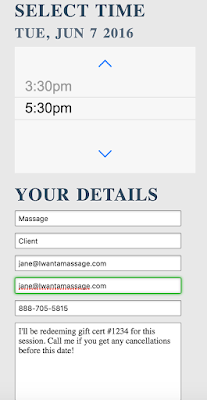 Once a session record is created (within 24 hours of the appointment time), our massage software automatically emails a request to the client to leave a testimonial. You can then choose to publish it to your online scheduling microsite. Ready to give it a try? Signup for our free 15 day trial. There are probably a thousand articles out there telling us how important it is to have policies, and they’re absolutely correct; it IS important to have policies. Those same articles will tell us how to formulate our policies and give us several examples of the type of policy the author favors. That’s good info to have, especially if you’re new to the whole creating policies thing and need some concrete examples to get your own policy juices flowing. Or maybe you just need some policies to copy verbatim so you can be done with the unhappy job of writing your own. 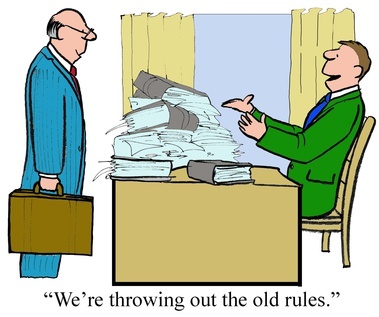 Two of the most common ways we’re counseled to create policies are: 1) Create policies that treat your clients the way you would want to be treated if you were a client, and 2) Create strong policies with clear penalties for violating those policies, then make sure to enforce those policies every. single. time. Failing to enforce them shows weakness and clients will take advantage of you if you let them. Seriously sound advice. The only problem is that neither way felt right to me. The first one felt more right, but I had a hard time with it. If you feel the same way or are just looking to tweak your current policies, here’s another way to think about them. Write them with a view to treating your clients the way you expect them to behave. This is the guidance I use to set most of my policies, but it’s not for everyone. I know that. I also know, that I’m not the only one who favors this style of policy writing. Earlier today I was investigating a local delivery service that brings organic produce direct from the farm to your door, and found that they have a cancellation policy very similar to mine. That got me thinking that perhaps some of my fellow massage therapists might resonate with this way of setting policies also. I’ve worked a lot of jobs in my almost 50 years of life, and I’ve had good bosses and bad bosses. The way they treated their employees was reflected in the ways the employees behaved… Not the other way around. The bad bosses always assumed the worst, refused to listen to employee concerns, ignored problems, or blamed them on the employees. They required doctor’s notes to prove you were sick if you called in. They wouldn’t allow you to take lunches or breaks away from your desk for fear you might be a minute late getting back. They wouldn’t give out paychecks until 5pm on Friday to make sure you didn’t skip out early. They scheduled every staff meeting at 8am to “make sure everyone’s on time to work, for a change.” These bosses treated every employee as a misbehaving school kid, and the employees responded by acting like misbehaving school kids. These jobs, not surprisingly, were plagued with poor morale and high staff turnover. *Note: There was no correlation in type of employer vs type of employment. Some of the jobs which required advanced college degrees had the worst bosses, and some of my retail jobs were the absolute best about treating employees with respect and dignity. However, my cancellation policy is very different from the standard ones. It reads: “24 hr notice is respectfully requested when canceling or rescheduling an appointment.” That’s it. I’ve had more than a few people tell me that it’s a terrible policy and that clients are going to take advantage of me left and right. They’ve told me that it’s not “business-like” enough. Frankly, they’ve told me in about every way possible how it’s a horrible, no-good, very bad policy but they haven’t convinced me of that. You see, my policy works for me and that’s all that matters. There are two things I let slide: illness and family emergency. Both often strike without warning and often within the timeframe of a more traditional cancellation policy. Almost everyone alive has had the experience of going to bed feeling great and waking up sicker than a dog. It’s happened to me both as a client and a as practitioner, and I’ve cancelled appointments in both situations. Besides, I ask them to NOT come into my office when they’re contagious, and I deeply appreciate them honoring that request. I would feel like a hypocrite asking them to stay home when they’re sick and then charging them a missed appointment fee if they stay home when they’re sick. I also can’t bring myself to give x number of sick days to a client, after which I terminate them. That works for some people, but not for me. 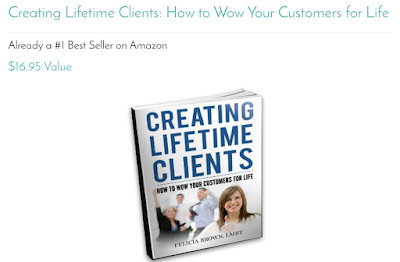 For as much “leeway” as I give my clients, I have very few late cancellations. By the way, I don’t consider it “leeway,” I consider it treating them like adults who know when they’re too sick to be leaving the house. Yes, having an appointment open up the same day affects my bottom line, but not as much as a sick client passing their contagion on to me would cost me when I have to cancel an entire day (or several days) worth of clients. It’s definitely a strategy/policy that takes a long-view approach. I’m not saying that you need to adopt my style of cancellation policy. Good heavens, no. What I am saying is that there’s more than one way to set the same policy. Use the one that works for you, no matter what anyone else says about it. You’re the one who has to enforce it, and you’re the one who has to live with the consequences of enforcing it. Therefore, it should fit who you are as a business person, not who anyone else says you should be. 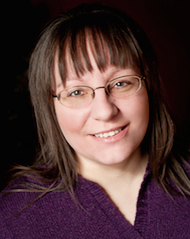 I am a Licensed Massage Therapist in Michigan and I’m Board Certified in Therapeutic Massage and Bodywork (BCTMB). 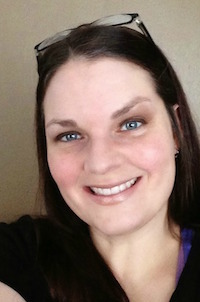 I have been a massage therapist and Reiki practitioner since 2002. 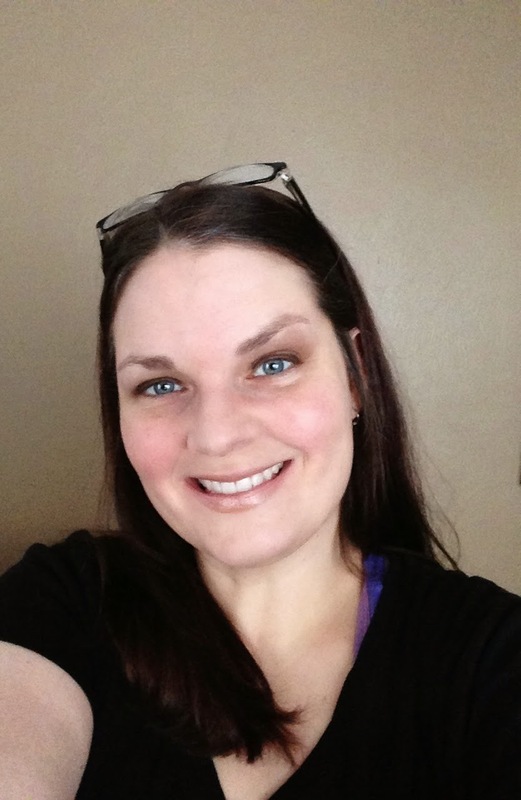 My specialty is treating clients with headaches, high stress, neck and shoulder pain, sciatica, and fibromyalgia, as well as other types of chronic pain. My training in energy work is extensive; over 200 in-class hours in a variety of energy work techniques including Reiki, Spiritual Healing (long standing and respected form of energy work in England), and Kundalini Energy Healing. 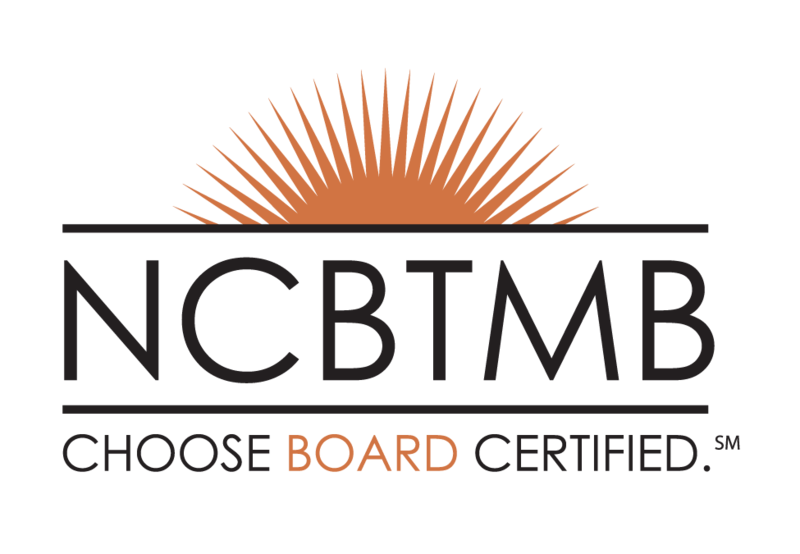 I am a certified member of Associated Bodywork and Massage Professionals (ABMP). 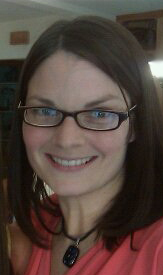 My education includes a Bachelor of Science degree in biology from Grand Valley State University. How Do You Know Clients Have Opted in for SMS Reminders? We've recently added a symbol within the client file under the phone number to show if your client has opted in for SMS reminders. The little mobile phone icon will show when the number has been verified as a mobile number within our system, and then the spiral icon will show when the client has successfully opted in to receive text reminders. 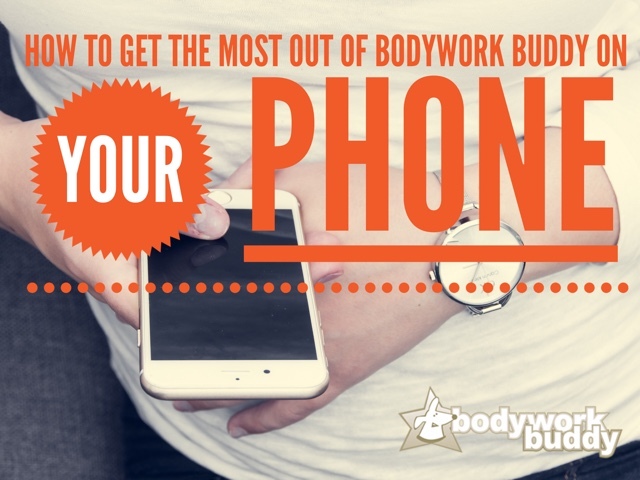 I often get asked if Bodywork Buddy has a downloadable app for phones and tablets. When we built BWB, we decided to go with a mobile responsive design for the entire system to be accessible on any mobile device via a browser. So while there isn't an app to download, the system works great on your phone through a browser by automatically adjusting the size of the site to your screen. 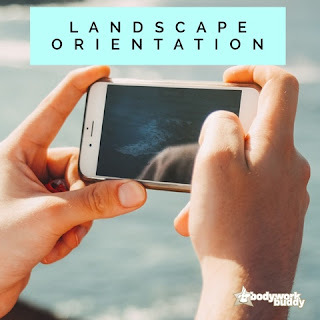 Bodywork Buddy is a pretty large and complex system, and in order to make it as a downloadable app we would have to make it more bare bones and the entire system wouldn't be accessible through an app. The app stores typically require companies to submit their apps (and any updates) for approval before being available for download. We make frequent updates and changes to BWB on the backend, and we're able to do this as often as needed without waiting for any approval from a 3rd party because we have our mobile responsive design instead of a downloadable app. This also means that when we have updates or changes, you automatically get those without having to install any updates on your phone or tablet. Having a downloadable app would also technically mean having 2 separate systems for our company to maintain: the main system and the downloadable app. As you can imagine, this would double our team's work load and take us longer to make updates and changes. Actually, it would triple our team's work because we would need one system for Apple, another for Android, as well as our desktop version. In order to provide the best experience for our members and the best customer service, we feel that the mobile responsive design is the way to go! In talking with some of our members, I've realized that what many therapists are wanting in an app is simply the ability to have an icon on their homescreen to click and be taken immediately to their BWB account. The good news is: an app isn't needed to do this! You can create your own clickable icon for your homescreen. The good news is: an app isn't needed to do this! This article details how to do this for different types of devices. Check it out and follow the steps according to what kind of phone or tablet you have! 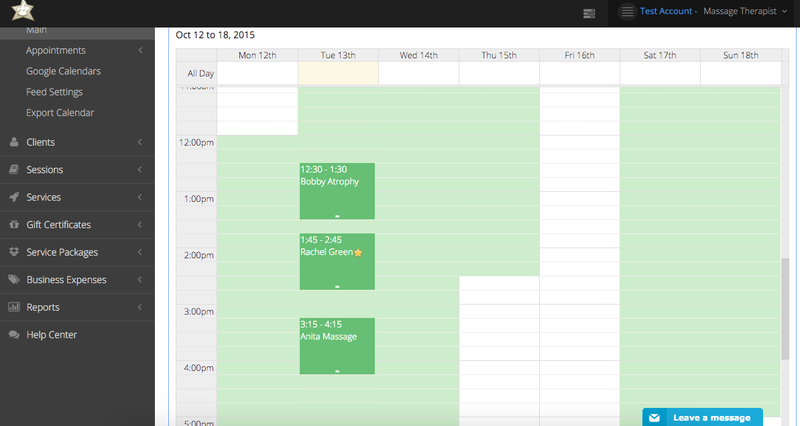 Try turning your phone to landscape when scheduling from the calendar or from different parts of the system. This will allow you to see more information all at once on the screen. 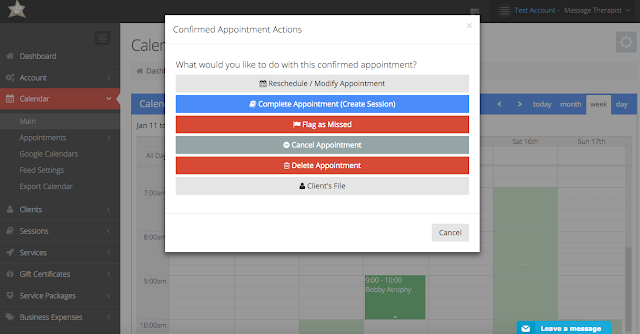 When you're trying to click within the calendar next to an existing event (say something in your google calendar that is synced to your BWB), zoom in on that day so you're able to click into the blank space next to the event to create your new appointment or event. Need to call a client? Do a quick search from the main clients page, find the client in the results, click right on their phone number next to their name to call immediately. 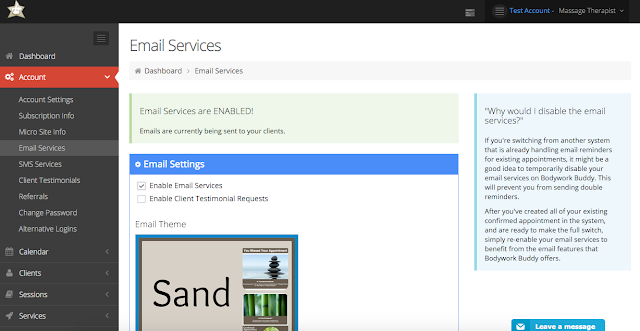 You can email clients the same way from your phone, click their email address next to their name in the client search results to open your email program on your phone and compose a message. 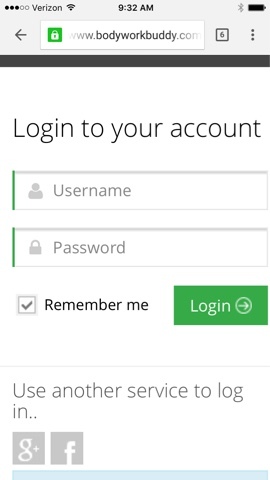 Stay signed in to BWB on your phone by checking the "remember me" box so that when you click on your icon on your homescreen, you're taken right to the inside of your account. Did you find these tips helpful? Let me know in the comments if there is something in particular you're struggling with, I'd love to help if I can. Cindy Iwlew, LMT is co-founder of Bodywork Buddy Massage Software, a complete online management solution for independent massage therapists that includes online scheduling. Last week we added a new feature that allows clients to leave a quick note for you when they schedule online. 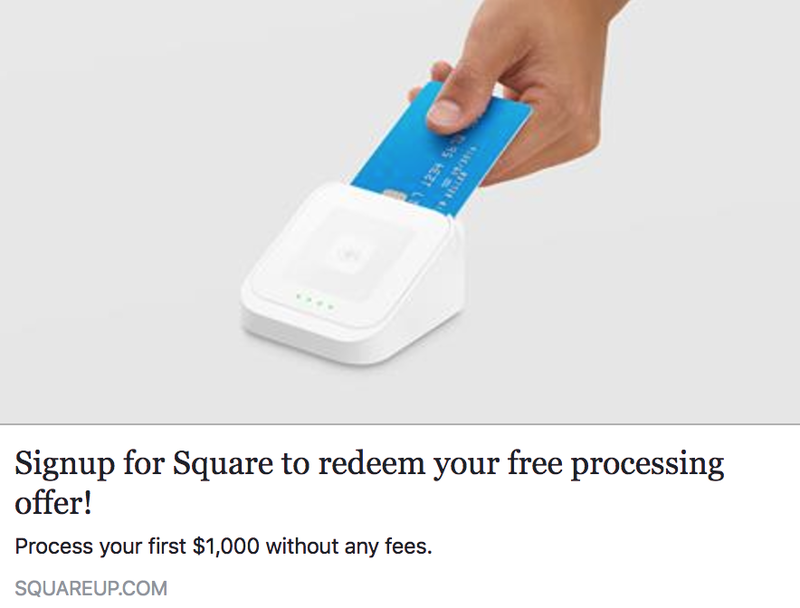 This is great if a client has a gift certificate they are redeeming, they need to tell you something that pertains to their appointment, etc. 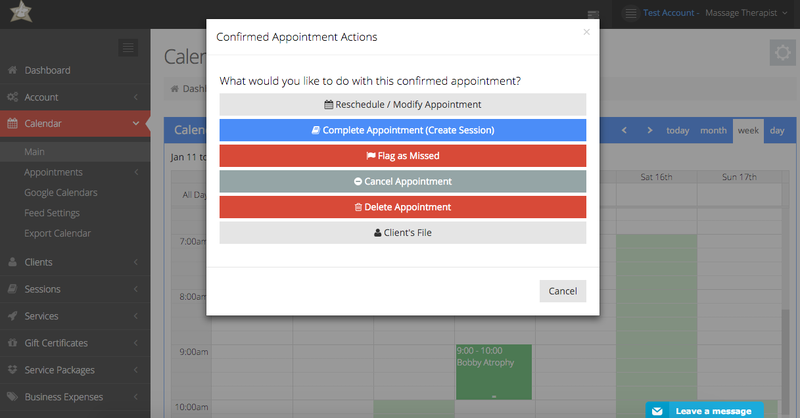 It's completely optional, so clients don't need to leave a message in order to schedule. When a client does leave a message, a speech bubble icon will show up next to their name for today's schedule on the dashboard as well as in the calendar. You can click on the bubble or hover over it to read the message. 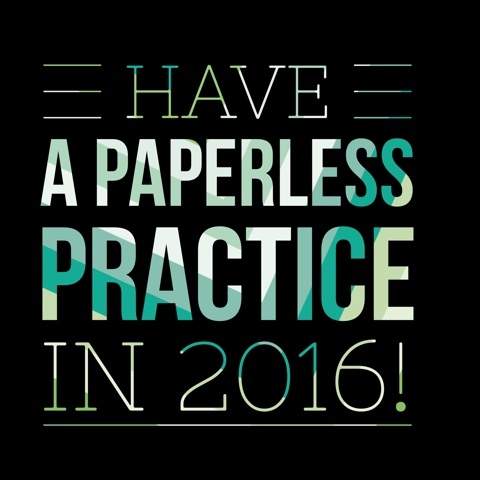 Start 2016 out right with a paperless practice! 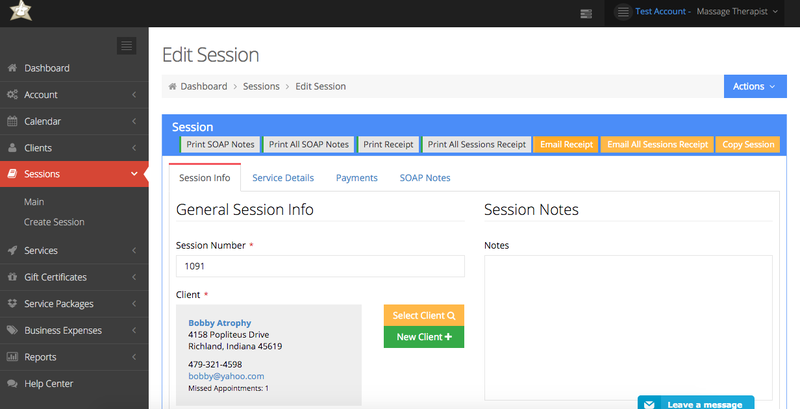 We've recently launched the new feature of online client intake forms in Bodywork Buddy. 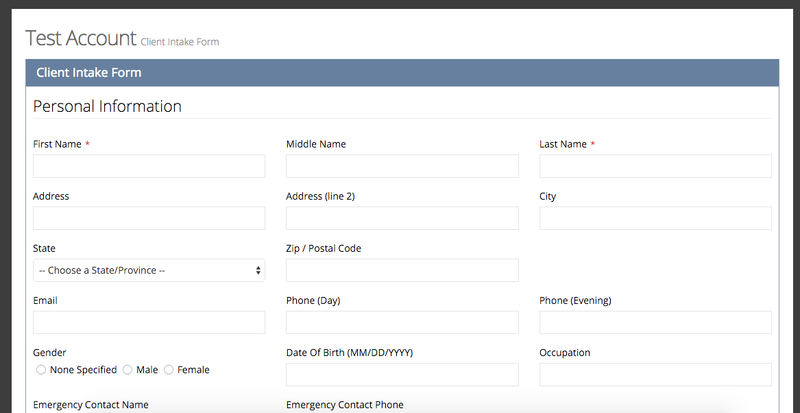 You can now email clients their form to fill out securely online and already have it attached within their client file in BWB. Add, delete, or edit any fields you want and click save. Hover or click over the blue "actions" button to open a preview of what your client will see. 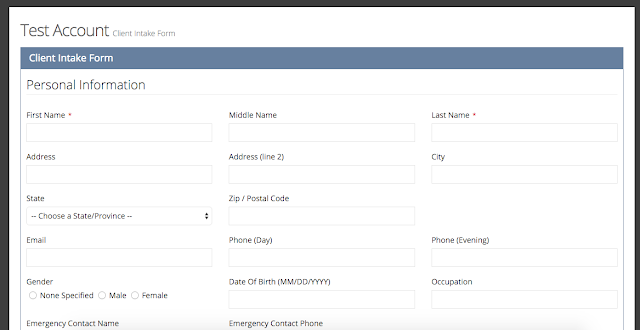 Clients can fill out their form (securely!) from any device with an internet connection: desktop, laptop, tablet, or smartphone. 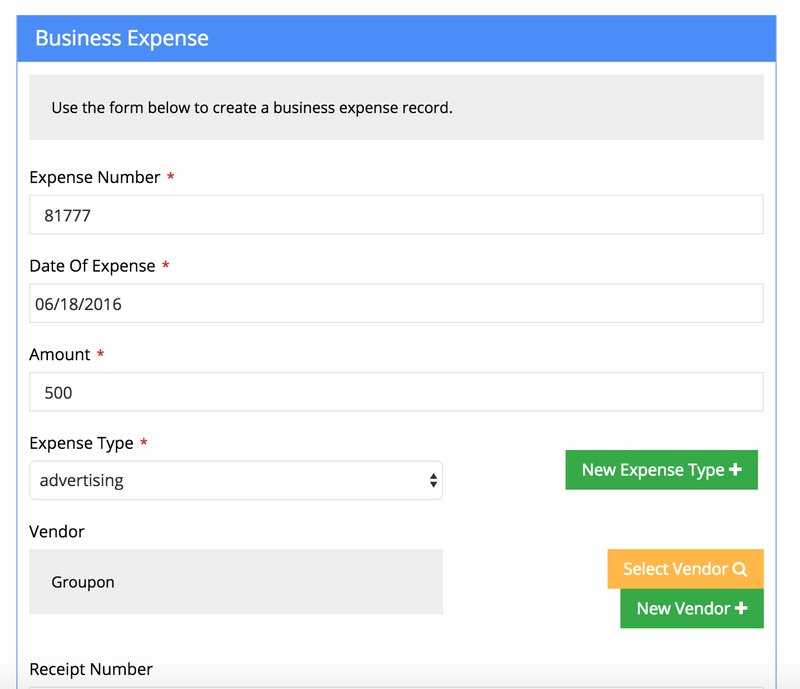 Their info will then be connected with their client file in your BWB account under the medical history tab, and also at dashboard > clients > intake form > main. 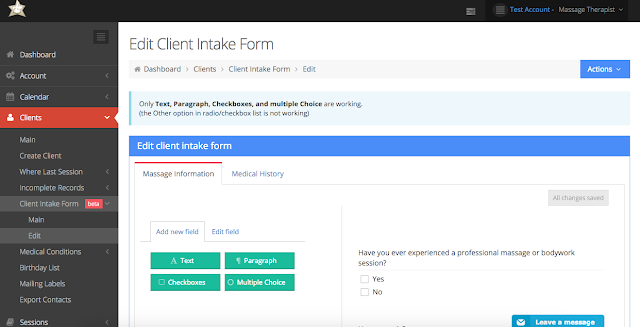 When a new client is scheduled with you, you'll have the option to send them an intake form. You can also send an intake form to existing clients anytime from within the client's file > actions > send client intake form. This feature is still in Beta which means we're doing some fine-tuning and there will be more cool aspects to this feature to come. 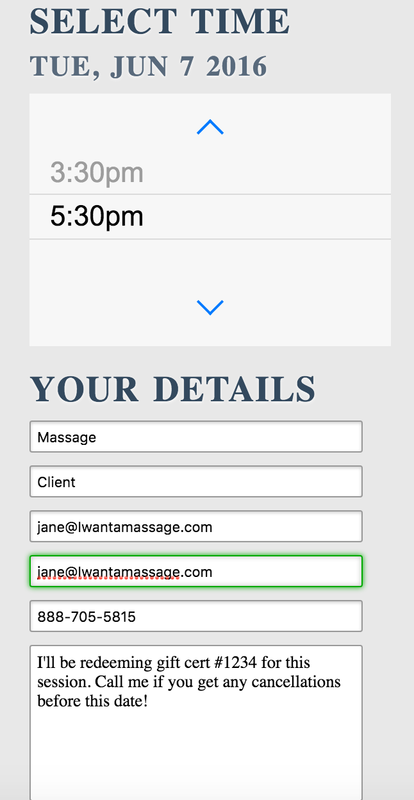 Like most online schedulers, Bodywork Buddy sends automated email reminders to your clients for their upcoming appointments. 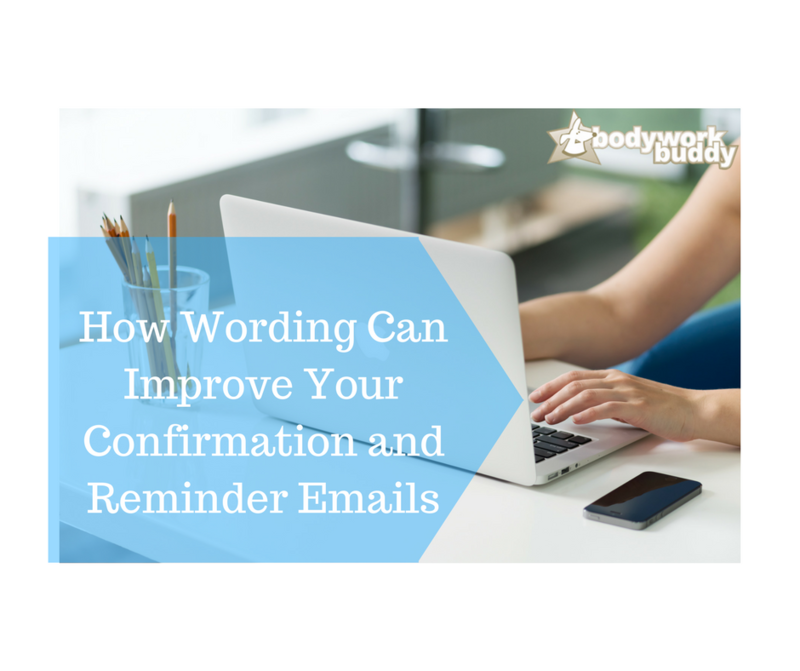 Unlike most online schedulers, Bodywork Buddy includes an email log so you can see when emails were sent and even when they were opened by each client. To see if your client received their email reminder, go to dashboard > account > email services > scroll to bottom "sent email history". Here you will see the most recent emails sent from the system in your account. If an email is labeled "sent", it hasn't been opened yet and the date/time stamp indicates the time it was sent. Once an email is opened, the status changes to "opened" and the date/time stamp indicates the time the client opened it. 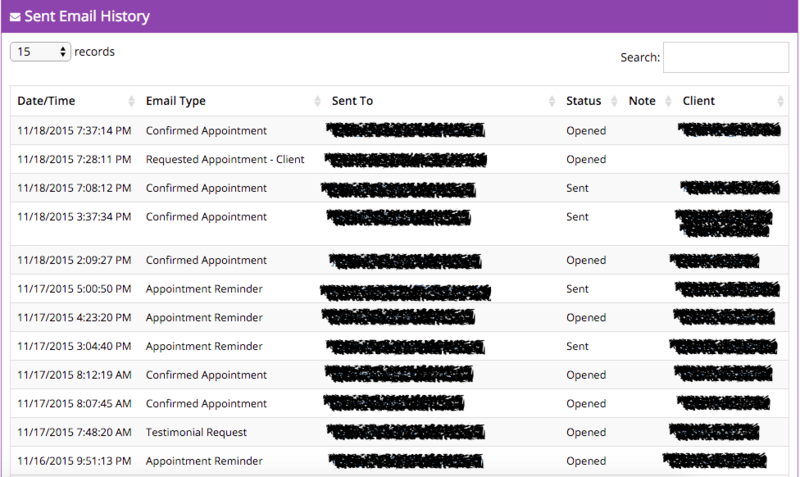 It also lists the type of email sent (appointment confirmation, appointment reminder, testimonial request, etc). 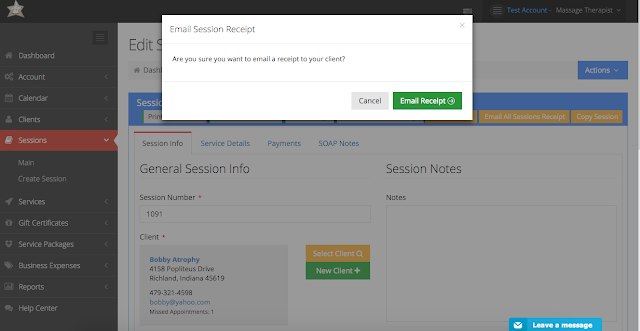 You can find the email logs for each client from within the client file as well. This is handy if you've ever wondered if your client received their email reminder, or to find out when the email address you have for a client is not valid or undeliverable. 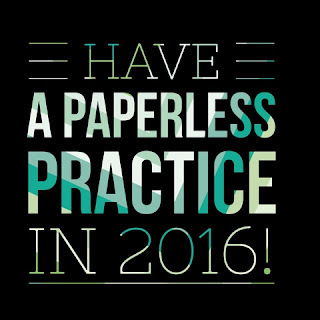 Email reminders cut down on no-shows and help enforce your policies. (Not to mention that they make you look like a rock star with their professionalism.) Bodywork Buddy emails include an area to add your own text as well as lists your cancellation policies. Want to try it out yourself and eliminate no-shows and last minute cancellations? 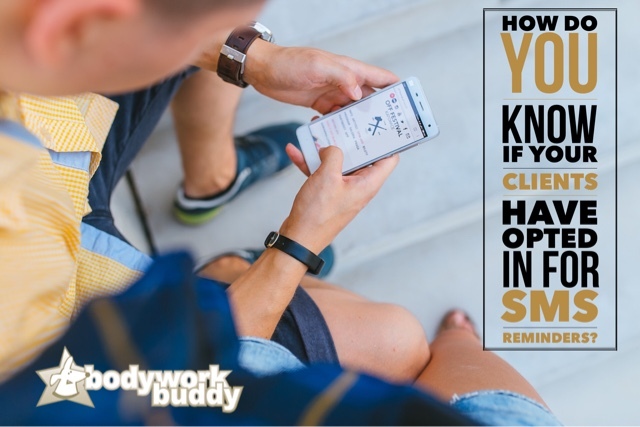 Sign up now for the free trial of Bodywork Buddy and we'll import your existing client list for you for free, so you can get started right away without needing to do a bunch of data entry! Over the weekend, we added a new feature that has been requested by our members. 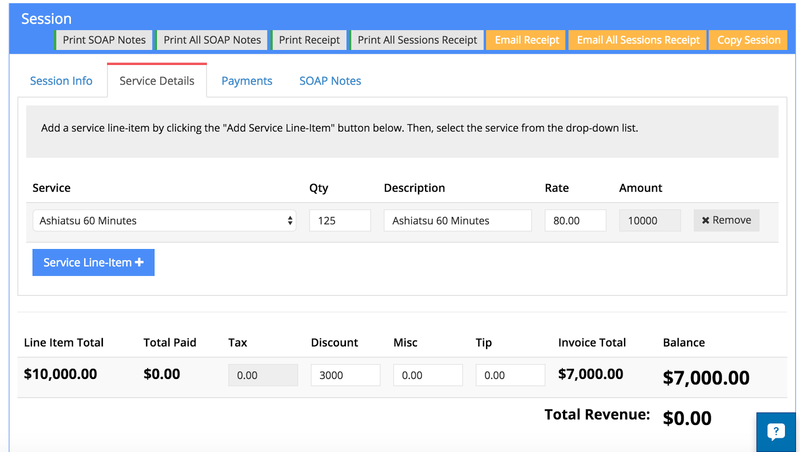 Now when there is a new client / client's first visit in your schedule, a star will appear next to their appointment in the calendar and on the dashboard in Today's Schedule. I never used to put much thought into my service names on my menu. I would just list them as the modality and amount of time. But after a while, I started to realize a few things. 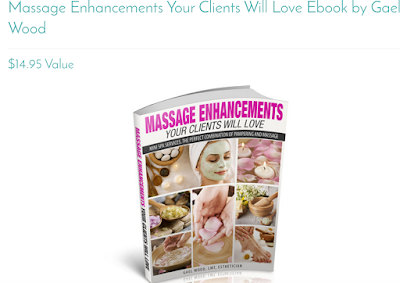 Not only do clients not know all the different modalities (and really, how could they? 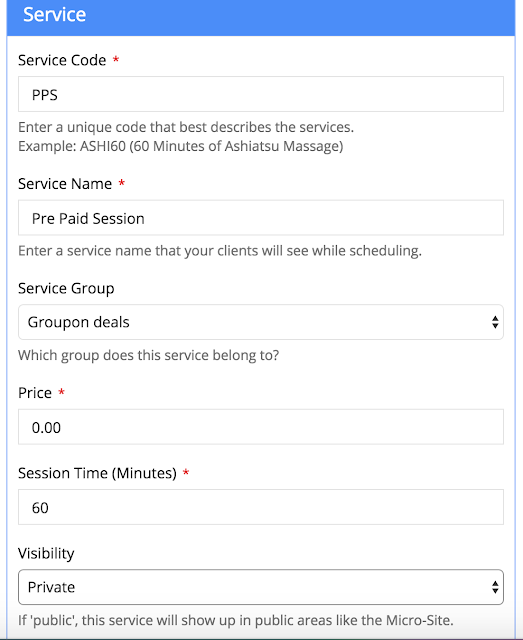 ), but they appreciate a simplified menu that makes it easy to choose which service to request. It's our job to communicate our services clearly and help our client choose the best service for them. Rather than list your modality names, create descriptive names that illustrate how they will make your clients feel, or what problem they will solve for your clients. 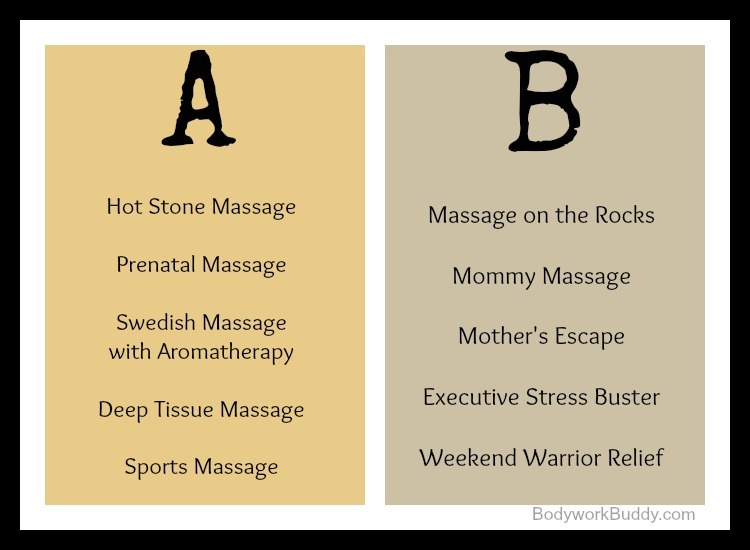 Which looks more appealing - Column A or column B? And this list is just using some pretty basic modalities as examples. Imagine a menu with things like Neuromuscular Therapy, Myofascial Release, Trigger Point Therapy...! A lot of clients don't know what those names mean. Make it easy for them with descriptive names. Take your favorite service or combination of services and call it your "signature massage". Put this at the top of your menu list, and mark it with an asterisk of *Recommended. 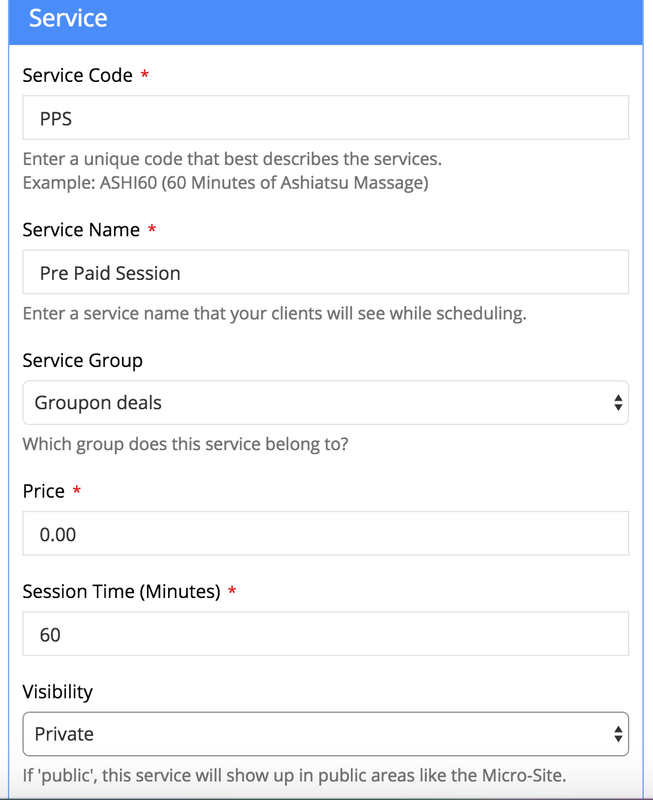 I'm willing to bet that 90% of your new clients booking online will schedule this service regardless of what it is. Have a non-massage friend look over your menu. 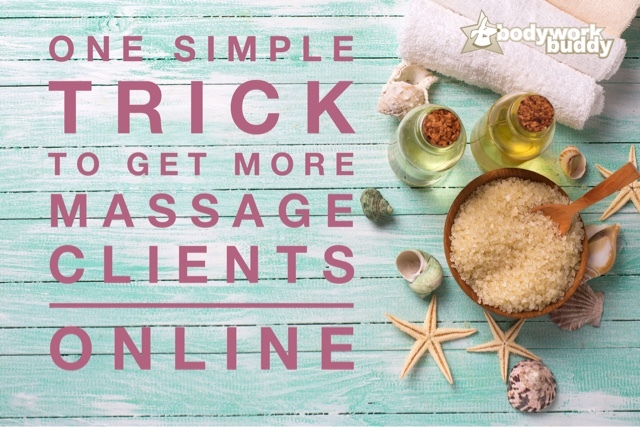 Do they have an easy time choosing a service knowing nothing about massage and being a complete bodywork newbie? Have an option for clients to choose a "completely customized session" based on their needs that day. They can just choose the time allotment (or have it for a set amount of time only - even better - LESS choices!). This is also a great way to make clients feel like they get a 5 star treatment knowing that you are "creating" a session just for them. Think of it like going to get your car serviced at the shop or getting a car wash. Notice how the car washes usually have a "recommended" service? And the maintenance shops have "winter tune-ups", etc? 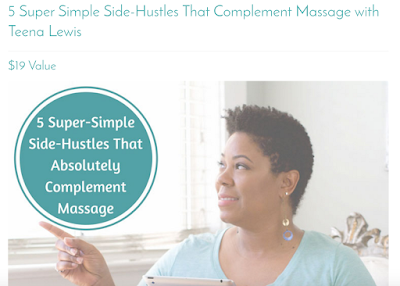 What creative spins have you put on your massage menu to simplify the process for clients? Comment below with any tips you have to add to our list. 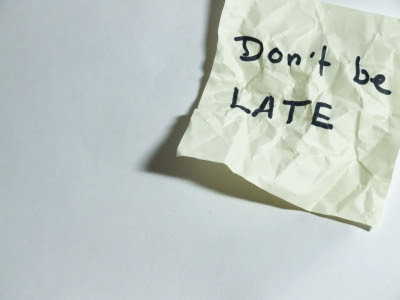 Despite having a cancellation policy in our brochures, telling clients when they call, and even taking credit cards for evening and weekend appointments, I would say our #1 issue that upsets clients is if they are running late. We do tell all new clients to arrive 10 minutes early to "fill out paperwork and use the bathroom so that it does not cut into your massage time" and most do. However, on two occasions this past month, people call to say they are running late 10-15 minutes. Our response, "Ok, just get here as soon as you can and we will have you do the paperwork afterward so you can get the most of your time." Some are understanding, but there are others who ask if they will be cut short. "Unfortunately, your therapist may be able to go over a few minutes, but she does have an appointment scheduled after you". (We do have 15 minutes in between to change sheets, say bye to clients, etc, not to go over on time.) This sends the client spiraling into why that's not fair, they want to reschedule, etc. I apologize and explain their appointment was scheduled from 10-11, and while the therapist does have some wiggle room, that time was reserved for them. "You were told at the time of scheduling about our cancellation policy. Unfortunately, if you want to reschedule, there is a $30 fee." 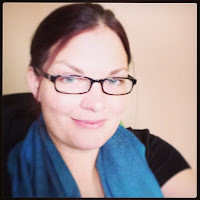 I obviously let things slide as much as I can and make it work in the clients favor when possible (and when they are kind about it) but I would be interested in how other therapists handle this. How have you handled this situation? What has worked well in your practice to enforce a cancellation or late policy? What do you do when a client gets upset over your policy?